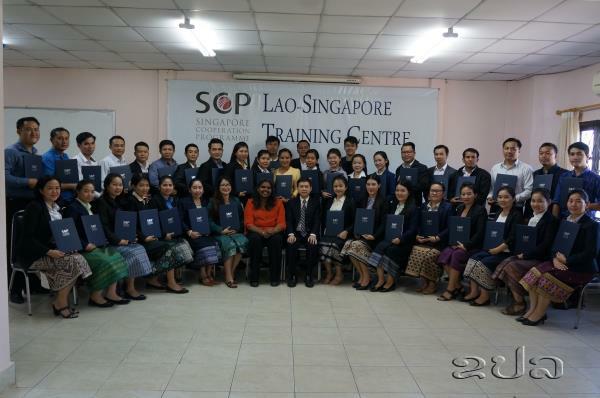 (KPL) The Singapore Ministry of Foreign Affairs has funded a three-week training course on “Intermediate English Language and Communication Skills” for 39 Lao government officials. Conducted between Oct 15 and Nov 2, the course, which was held at the Lao-Singapore Training Centre, was conducted by Ms Sheila David from Green Olive Tree, Singapore. This course was designed to enhance the English language and communication skills of the participants. It also provided participants to acquire an intermediate level of command of the language, for the purposes of listening, reading, speaking and writing.